Louis Jouffret was on the end of a terrific move to score Batley's first try. Batley Bulldogs produced arguably their best 40 minutes of the season but it wasn’t enough to prevent a 38-12 defeat against Betfred Championship high fliers Toulouse Olympique on Saturday afternoon. The Bulldogs deservedly led 12-10 at half-time and could have gone into the break further ahead as they appeared to have their full-time opponents rattled. However, the French side clicked into gear after the break, assisted by some favourable refereeing decisions, as they ran in five unanswered tries playing down the slope although the final scoreline was harsh on the battling Bulldogs. Toulouse struck the first blow after 14 minutes as Rhys Curran, William Barthau, Bastien Ader and Tony Maurel stretched the Bulldogs wide on the left before play was switched back inside and Joseph Bretherton stormed through and over at the side of the posts, giving Mark Kheirallah a simple conversion. Batley were the better side for the remainder of the half and deservedly levelled with a cracking try after 23 minutes. Sam Wood stormed down the slope and offloaded to Dave Scott, who continued the move and slipped a well-timed pass inside for Louis Jouffret to race away and dive over at the side of the posts, with Scott converting. Jouffret then produced a deft kick to the in goal area but it was just too far for Wood to ground. Batley attacked again and looked to have created an overlap. Oliver Russell flipped the ball out of the back but it was intercepted by a defender as Toulouse survived. Having weathered the storm, Toulouse produced a rare foray into Batley territory as Barthau and Anthony Marion linked to send Constantine Mika over for an unconverted try. Undeterred Batley stormed back down the slope as two penalties put them back on attack. Jouffret almost put Lewis Galbraith in at the left corner and as Batley took play close to the line following another penalty, Alistair Leak nipped over from acting half-back and Scott converted to deservedly edge the Bulldogs ahead. The lead didn’t last long, however, as Toulouse struck three minutes after the re-start when Justin Sangare stormed over at the side of the posts and Kheirallah converted. The turning point came after 51 minutes when Batley were deemed to have knocked on despite strong claims they had the ball stripped in a tackle. Toulouse launched an attack on the back of the scrum and Barthau’s long pass put Maurel over in the corner. Tom Lillycrop vented his frustrations at referee Tom Crashley and was subsequently shown a yellow card before Kheirallah landed a touchline conversion to put the visitors 22-12 ahead. Batley were still down to 12 men when Barthau kicked through, Sangare hacked the ball on and Barthau won the race to touch down with Kheirallah converting to extend the lead. Batley continued to be frustrated as key decisions went against them and Toulouse bagged a fourth try in the space of 19 second half minutes when Maurel crossed in the left corner and Kheirallah landed another towering goal. Batley tried in vain to get back into the game but it was Toulouse who scored again as they moved play right and winger Paul Marcon finished spectacularly in the corner. 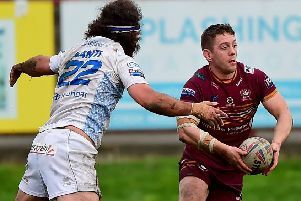 Galbraith was shown a red card for speaking out of turn and although Batley had given their all, it wasn’t enough to prevent a seventh defeat from their opening eight league games. 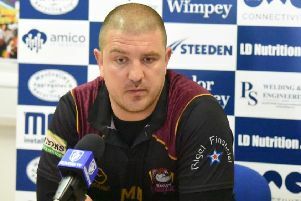 Batley Bulldogs: Scott; Walker, Wood, Galbraith, Campbell; Jouffret, Russell; Gledhill, Leak, Dickinson, Downs, Tomlinson, Manning. Subs: Brown, Taira, Lillycrop, Smeaton. Toulouse Olympique: Kheirallah; Marcon, Jussaume, Ader, Maurel; Marion, Barthau; Boyer, Parata, Bretherton, Mika, Curran, Santi. Subs: Bouscayrol, Puech, Hepi, Sangare.